I place the plastic clip on my finger and wait a few moments for the soft rush of sound to find its base rhythm. Soon, the wash begins to swell, remixing the resonant pitch and drop of my own heartbeat. Changes in movement and heart rate cause subtle shifts: the soundscape dips, stretches, slows down, speeds up. 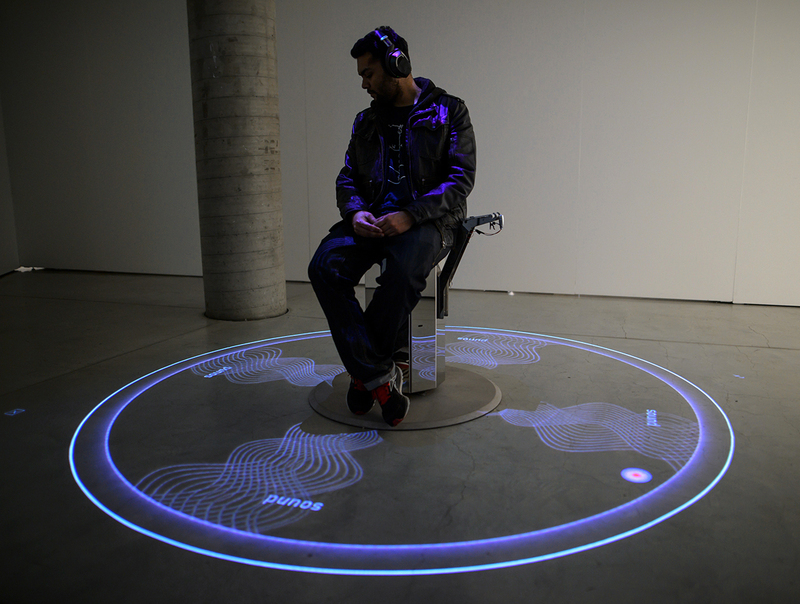 In George Poonkhin Khut‘s work, collaborators Gail Priest and James Brown have written music designed for augmentation by the listener’s own body. Simple instructions, asking the participant to take long, deep breaths, align the work with mindfulness principles, prompting thoughts about our biological responsiveness to sound and the kinds of bodily effects we might be subconsciously craving when we reach to put our headphones on. Geared towards sonic futures of various kinds, those that like Khut’s work feel tantalisingly close to being an everyday reality, and those which are much more speculative, Gail Priest’s interactive and well researched exhibition is especially interested in what future artworks may sound like, and the role art can play in generating new sound-driven ecologies. The intimate and sensual cocoons of bio-remixed sound that Khut’s work generates — there are extra headphones so that others can listen in to your own unique soundscape as it unfolds — offer an exemplary response to Priest’s prompt, and a gentle introduction to the exhibition as a whole. To be smeared in, or by, time is the universal fate of all entities living and otherwise, as Pia van Gelder and Tom Smith explore in their work Iron Star. Here they deliver an impossible scenario sounding the future of iron to its total demise a star’s death-state before becoming a supernova, at a time well beyond human existence; beyond the sun, beyond sound. Two screens sit side by side, the first telescopes out from what can be doubly read as iron ore and the universe itself at a close distance then scaling up in magnitude: delicate markings on a black background hand-drawn by van Gelder repeat to an awesome expanse. On the second screen, small stock photos flash in serial repetition through different categories: anchors, nail scissors, helmets, engagement rings. Smith’s score coldly inquires outwards; moments of intense rupture are bracketed by provisional calm. 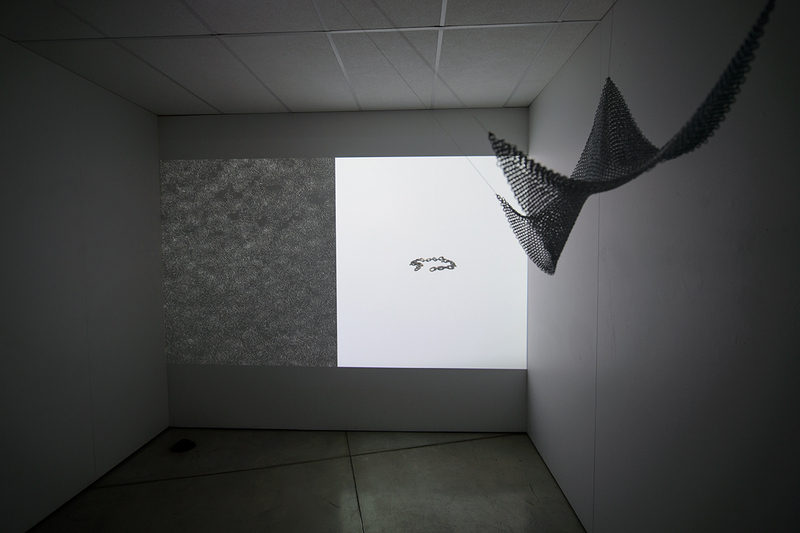 In one corner of the space, a small pile of iron filings grounds the work, and in the other, a wavelike sheet of chain metal drops from above creating a magnetic interplay between audio, image and object that transports gallery-goers to a richly evoked no-place at the dark fringes of philosophical and scientific understanding. The dual meaning at play in the exhibition’s title, where “sounding” can mean to produce sound as well as to test or ‘sound out’ an idea or concept, holds true in all the works. Peter Blamey’s installation Shelter Fallout/Spark Harvest presents a post-apocalyptic scenario where minimal wooden shelters — including a kennel for the dog, a welcome nod to the necessary centrality of non-human species in any conversation about futurity — are paired with solar technology, allowing possibilities for the manipulation of sound and light even in the barest circumstance. What kinds of cultures could develop from this starting point? Blamey’s work brings to mind media theorist Jussi Parikka’s concept of “medianatures” in its neat distillation of inseparable yet distinct conditions: biology and technology bound in an eternal state of coproduction. 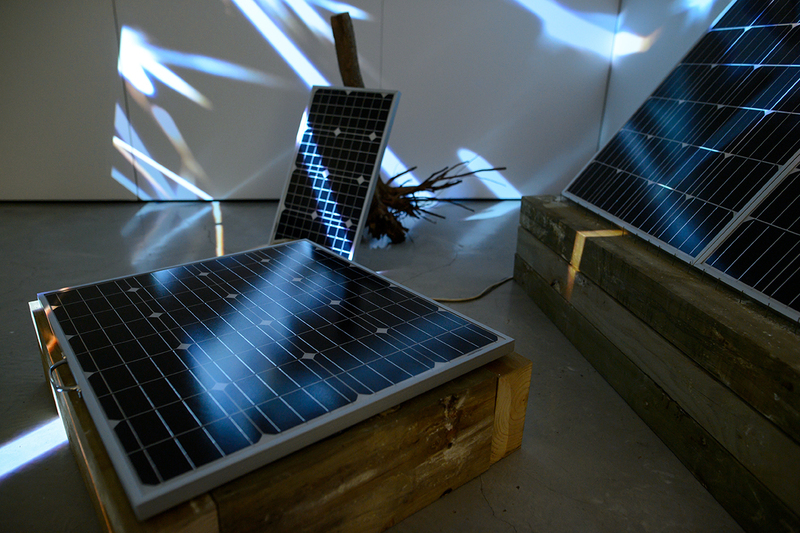 Developed from Donna Haraway’s “naturecultures,” medianatures help us to understand that the technology we use to produce sound is always at the same time matter from the Earth as well. The documentation for this project, over three hours of material in all, is a substantial fictocritical project in its own right, available in an enhanced ebook that reproduces the hypertexts of Priest’s title work and as an adaptation on Radio National’s Soundproof program. The focused contributions of Khut, van Gelder and Smith, and Blamey offer three distinct sonic futures that illuminate aspects of this research; bio-sonic for George Khut, geo-sonic for Pia van Gelder and Tom Smith, eco-sonic for Peter Blamey — there are countless more. Gail Priest’s surprisingly upbeat show successfully expands possibilities for art-making and begins to redress the historical sidelining of sound across disciplinary fields. Read the exhibition catalogue and view the full Sounding the Future project website.